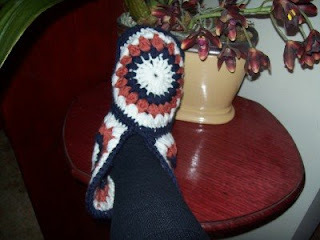 Well I found this free pattern on line, for a pair of hexagon boot slippers. Now knowing US foot sizing is different to AU sizing, I decided to make them im 100% wool that I could felt if they were too big for me. As you can see from the picture below, they were far too big. So now my very first felting project had to come to light. Compare this picture to the picture underneath it for the felting success. Small enough to fit me now. But I did have an adventure felting these. 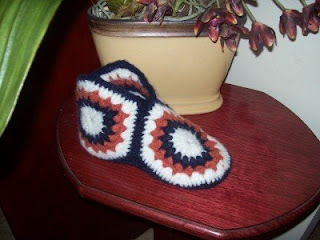 I first tried felting by hand, but the slippers were too big to do it by hand, I even had them boiling in a pot for more shrinkage. 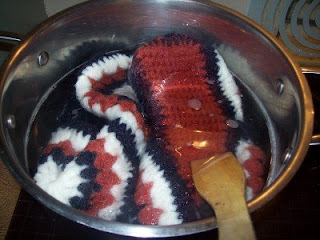 Scrubbed lots and lots of a high quality dish washing liquid into them and even gave them the shock cold water process. I was not getting far at all by this stage. The idea of machine felting was against me from the very beginning. I have a front loader. 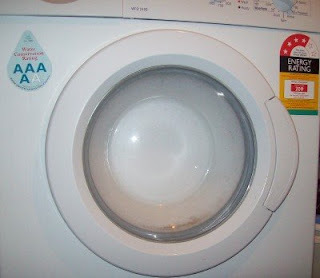 Once the cycle begins, you cannot open the door to check on the felting process, also my machine is not connected to hot water, so I had to fill up and boil the kettle several times to fill the lower part of the machine. 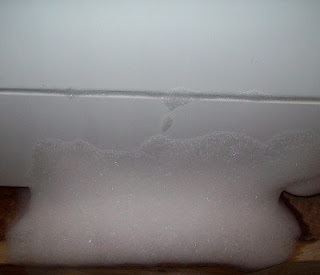 I thought I would be fine to begin the cycle, front loaders use low suds powder or liquid and I neglected to rinse out all of that high quality dish washing liquid I had begun with! Eeek, my machine is not supposed to look like this! Eeek! 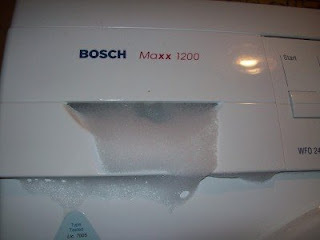 It is foaming from places it should not be! It's foaming from more places! 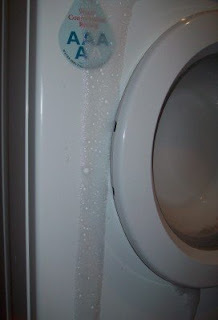 I have a foaming mess! After draining and cleaning up, I begin another cycle with hot water. 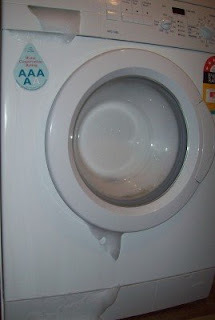 This is what the machine should look like when it has a load in it. No foam! My slippers are actually in there at this point too. Once the second cycle of the felting had finished I saw the results! Yes, thay have felted and shrunk! I stuff them with news paper to shape them and dry them off in front of my little fan heater. Not all of my crocheting went to plan either, I ran out of the blue wool on the second sole and had to use another colour, oh well, I'll be walking on that part any how's. I'm sure I could have felted these a little bit better and they do need a little more shrinkage. But wait for this, after this fiasco, a US crochet buddy said, I could have just washed the slippers first then put them into the dryer for felting! Why oh why did I have to find this out the hard way. 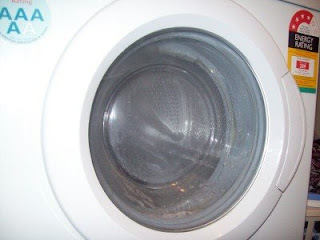 I am going to wash then once more and put them into the dryer, I can also open the dryer door to check on their progress. When they first dried I was so excited and put them on, then ran into the kitchen to make a cuppa', woops! I nearly went for a sixer, the soles are far too slippery! 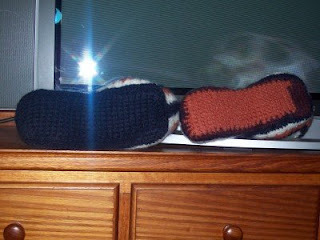 I know there are several ways to make a woolen sole non slip, I just have to plan that one out next. I do hope you get some enjoyment out of reading this post! 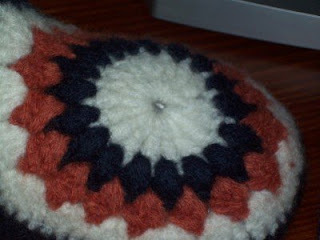 By the way, I think felting is just a fancy word for shrinking wool, what do you think? 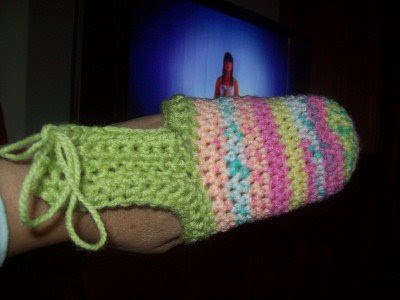 Why am I making so many slippers? Well it has to do with the cream coloured carpet that comes with my new house. Because of the cream carpet, there will be a, shoes off before entering rule created. 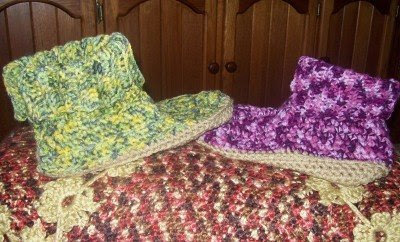 So I am going to supply an assortment of slippers for those who stroll in and choose to keep their feet warm and cosey with the slippers. 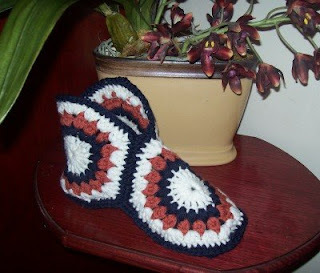 The slippers I have made here are so easy, it is not my pattern, but you can find the free pattern here. 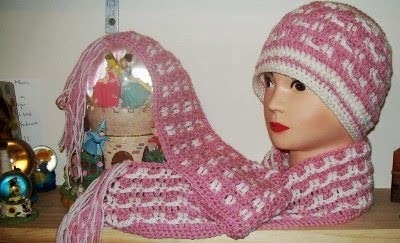 It is a versatile pattern that you can easily make changes to, easy to follow pattern, quick to make up and you can make them quite quirky with lot's of colour changes too! This is the first pair I made. 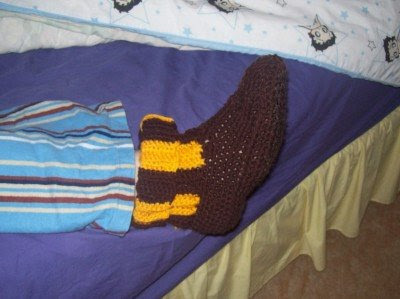 Now Nathan, my son-in-law to be, was promised a pair of slippers ages ago, so here are his, in the AFL Hawthorn football team colours. 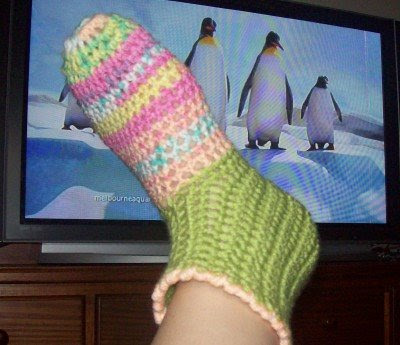 I was trying to make these for hubby but they were too small. 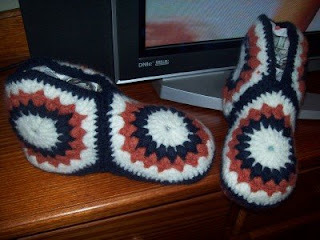 So here we go with a bigger pair for hubby and by the way, it is the first thing I have ever crocheted for hubby! Am I bad? I did a long trc with sc around the tops too. They look odd in the making up process. But here they are finished. 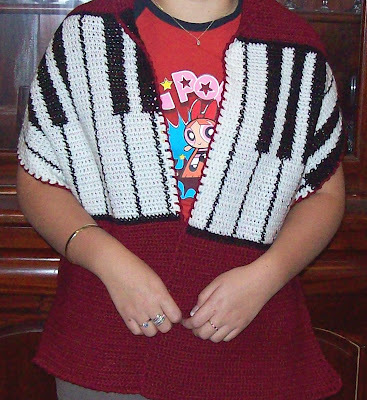 I did not crochet in the back loop of this pair, as the pattern states. 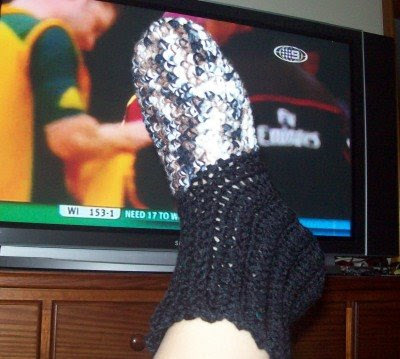 I hope you have enjoyed my slipper post once again. I have another slipper story to tell too, but that one is more interesting, just wait for it. LOL. I finally took the Piano Wrap to my Mum's this week-end. I got her to close her eye's and stand in front of a mirror whilst I placed it over her shoulders. When she opened her eye's she started laughing with pleasure and humor and said "I can wear that to Church tomorrow". And she did. When she walked into the church every body commented on it, but when she finally played the piano, she forgot to put it on, LOL. 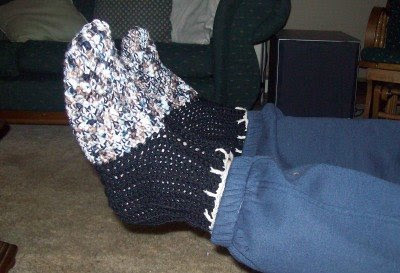 And for those slipper socks, I'm going to have to make plenty more, I've already been wearing both pair! 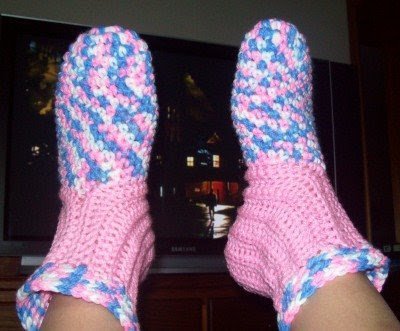 They are so warm and comfy, I think they are great! Lily is our second eldest grand child and our eldest grand daughter. Today the 31st of May, is Lily's 9th birthday. Her Mother made a wonderful tea party setting for Lily and her birthday friends. Just a small collection of Lily's presents so far. 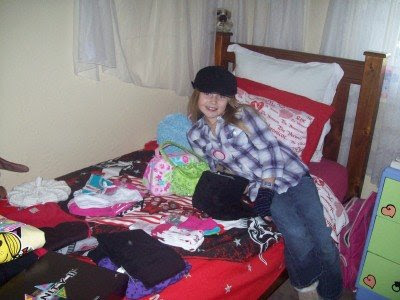 Lily is such a trendy kid, she just loves fashion! Now here is Bella (4) being a mother to Bradyn (1). Darcy who turns 7 next month was so grateful to have a boy to play with, Cooper (3). Darcy gets very sick and tired of his sisters and no boys to play with. Most of his cousins that live close by are girls too, so he just loved being with with Cooper today. 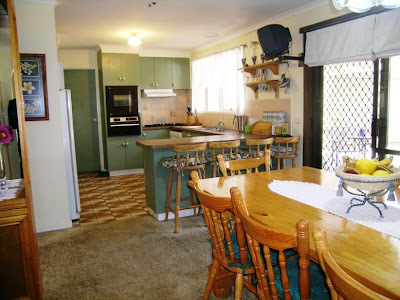 My kitchen has gone from this, 8 seater table and 4 stools. Make shift seating with the out door setting. Now we have a sweet little setting ready for the new house that was bought at auction on ebay. I just hope all of the pieces of furniture I have chosen to use for my dining room will tie in nicely. 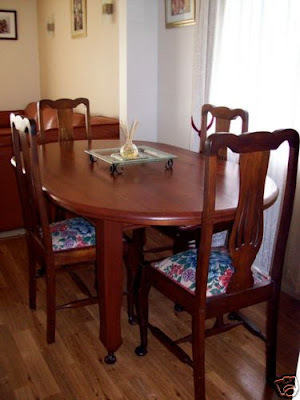 The furniture pieces I already have, were all hand made by my brother. After our visit to the birthday girl, we took the boys with us to view the progress of the new house. 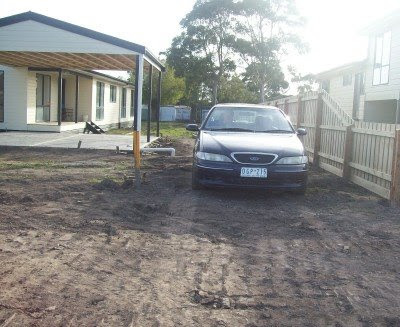 We now have the fencing up and the exterior house painting is completed. This is down the very back of the block and the boys just loved the messy dirt mounds. Now of course we had to go for a walk on the jetty once again. The tide was out when we were there, lucky for us as Braydn was rearing to go! Cooper and Bradyn are pictured here with Pa.